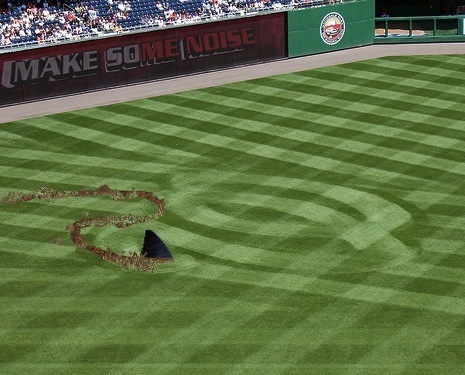 Sunday was Roger Bernadina's first start since last Tuesday, and while the Nationals lost, the Shark contributed a single in four at bats. He started the game in left, then moved to center when Ankiel was taken out of the game. It was great to see the Shark on live television, basking in his sharkadelic glory. Watching the game, however, made me realize one of the reasons why the Nationals organization might be opposed to the idea of a Shark in the outfield.